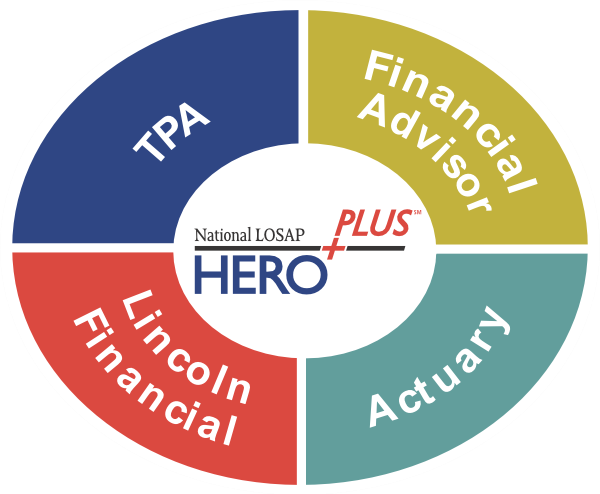 The HEROPLUS℠ Program brings together a suite of services from several different providers into a single offering to help reduce costs and provide flexibility for both plan sponsors and participants. The program can be customized at the local level to meet the specific needs of the plan sponsor, without having to amend the plan document. The HEROPLUS℠ Program provides the plan document and a comprehensive service model that centers on your needs, giving you ongoing access to a team of service providers who can assist you with all aspects of your plan. Lincoln Financial provides the program support, investment platform, recordkeeping administration, and web support. Ibbotson Associates provides the investment lineup to defined contribution plans. Financial Advisor assists both you and your participants with investments. For defined contribution plans, the financial advisor provides your participants with education and information on investment selections and options, based on their risk tolerance, investment time line and retirement objectives. For defined benefit plans, the financial advisor provides information to help you construct an appropriate investment strategy. Third Party Administrator (TPA) designs the local service agreement, provides compliance services, and general support to the sponsoring agency. Separate TPA fees may apply. Actuary (defined benefit plans only) determines the required funding needed to meet the plan obligations. Separate actuarial fees may apply.